This article outlines the steps for identifying pictures that have been misplaced on your hard drive. Many times I get pictures through our emails or from the web. It happens very often that I place these pictures in My Documents just because I want to look at them quickly and I don’t want to file them in the proper folder. After a while however, I end up with quite a few pictures being “lost” in the wrong places. This article will help you find them and identify them so you can move them to the appropriate folders. It is assumed that you are able to see the Date Picture Taken in your file browser. If not read the article Find Pictures. Many times I talk to people that are overwhelmed by how many digital pictures they have on their computer and how frustrated they are when they can’t find the pictures they’re looking for. I sympathize because, I was frustrated as well until I started learning how to organize my pictures. One great benefit of being organized is knowing where things are. But what do you do when you want to start to get organized? 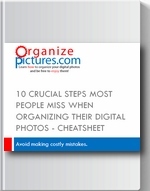 How do you find lost pictures and organize them? STEP 1: Sort by “Date Picture Taken”. This is the easiest way to identify all “floating” image groups. Use what you have done in Step 1 in order to sort and group all “floating” images. By clicking on the Date Picture Taken column header, you will group all the pictures according to the date when each picture was taken. Now you can easily spot the pictures taken during the same day. STEP 2: Create a folder for each group. Let’s take a look at Group 1. Upon double clicking a few pictures of that group Mary quickly realizes that that was a church function that they attended way back in 2004. It was a church picnic at Freedom Park. The date when picture was taken value indicates it was on March 7, 2004. While the day is sometimes not very important the month certainly is. 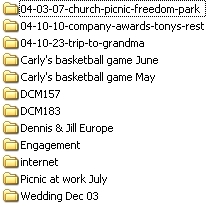 So, this folder will be called 04-03-07-church-picnic-freedom-park. Group 4 was a short trip to grandmother’s house for the weekend. So, we named that one: 04-10-23-trip-to-grandma. Group 5 turned out to be from the Internet. These were some nature pictures that Mary liked. Since these are not family pictures and don’t have a particular event or date associated with them, we called them: Internet. After all this activity, our pictures folder looks like the figure on the right. Notice that the folders we created are automatically sorted making them very easy to find and identify.